Last year Helios Chamber Opera and Melos Sinfonia put together an imaginative programme, The Bear Goes Walkabout, which combined Walton's The Bear with two new one-act operas. 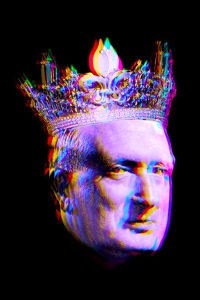 They return this summer with another intriguing combination, the double bill of Walton's Facade and Peter Maxwell Davies's Eight Songs for a Mad King which they are performing at Grimeborn, in Kingston upon Thames and in St Petersburg. Directed by Ella Marchment (artistic director of Helios Chamber Opera) and conducted by Oliver Zeffman (founder of Melos Sinfonia), the performers included reciters Charmian Bedford and Danny Standing and Samuel Pantcheff as the baritone soloist in the Maxwell Davies. We caught the double bill's first night at the Arcola Theatre's Grimeborn Festival on 5 September 2014. Both pieces were designed by designed by Holly Piggott, with choreography by Joseph Toonga, video by Benjamin Fox and lighting by Christopher Nairne. Marchment had set them both in the context of a post First World War hospital for the shell-shocked and used each work as a way of exploring madness. The Walton was performed by inmates from the hospital and preceded by them assembling, to a sound-track which combined spoken passages from WW1 letters with evocative sounds of shells and such. The various movements of the Walton formed a kaleidoscopic exploration of random thoughts and feelings, emphasises by the projected visuals which either showed scenes from WW1 trenches or nostalgic images of pre-war garden parties and children's boat trips. The order of the movements in the Walton had been altered; in fact the traditional order was fixed quite late. And included in the mix were movements from Facade II, movements from the original which Walton revived in the 1970's; these are sparer and darker and added a more threatening element to the mix. Towards the end of Facade an extra character appeared on stage, it was not clear who he was and clear that the two reciters, Bedford and Standing, did not want him there. This was Samuel Pantcheff the protagonist of Eight Songs for a Mad King. After the interval Maxwell Davies' work was performed as if it was being given by one of the inmates of the hospital who thinks he is George III. The instrumentalists were all turned into birds, and the projections mixed scenes from WW1 with more abstract graphics. Turning Facade into a piece of music theatre, especially one which explored the aftermath of WW1, shed an interesting light on the work. The surface glitter of the roaring twenties which inhabits the piece, was put in a new and more desperate light. Like the denizen's of Ravel's La Valse, these are people dancing on the edge of a precipice. Bedford and Standing gave strong dramatic performances and the result was exciting and intriguing, but Edith Sitwell's words rather came off worst. There are a lot of words to be learned (and Facade is usually performed with the reciters reading the words) and frankly, a lot of the physical theatre got in the way of the text. Radio mikes were used (and seemed a bit problematic), but at times it just wasn't possible to hear the words. The faster patter songs came off worst. Bedford found an apt range in her voice to enable much of what she said to carry, but Standing's pitch range seemed a little to low so that though he was highly expressive, the sense did not carry. The reason why I go on about this is that Sitwell's words are important, the sound, sense and rhythm of them. They are part of the music and the reason why we have reciters not singers. But I have also to realise that this was the first night of a budget production, and not everything will have been as the director quite wanted; certainly I am sure the performance will develop. Maxwell Davies's Eight Songs for a Mad King was frankly stunning. 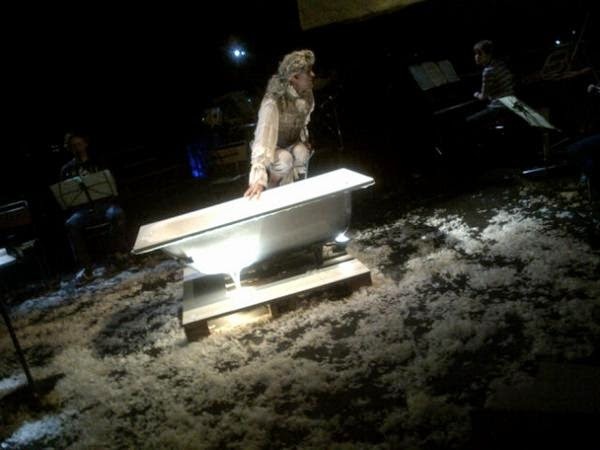 Here we had a piece which was designed to be music theatre and Pantcheff's incarnation of the protagonist was mesmerising. Marchment had created a sequence of dramatically credible scenes, much involving a bath! But it was Pantcheff's spot-on projection of the variability of madness, combined with his incredible vocal histrionics. The vocal part, with its combination of baritone and alto registers with extended vocal effects, was written for the South African actor Roy Hart and was tailored to his particular skills. This means that each soloist must find his own way through the part, this Pantcheff did confidently and dazzlingly. In both works, the players of the Melos Sinfonia were impressive in their confidence and style. To each work they brought not only skill but also a sense of the sound-world of the particular work. Both require extended solo playing, and we got some lovely moments. Conducting music theatre requires skill and an ability to keep calm control whatever is happening around you. This Zeffmann did, directing with aplomb as well as become part of the action at times. This was a vivid evening of music theatre. Not everything worked,but the confidence, verve and vitality of the young performers impressed and this was music theatre which was vividly alive. 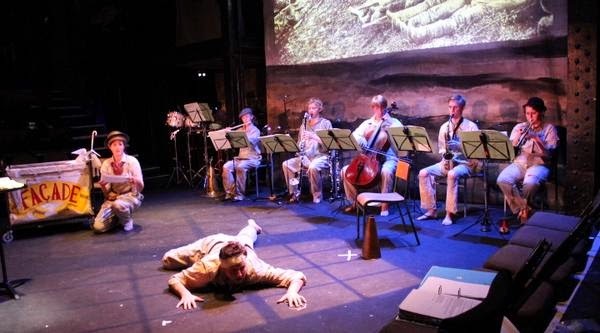 Helios Chamber Opera perform the double bill at the Grimeborn Festival on 6 and 7 September 2014, at the Rose Theatre, Kingston, on 10 September 2014 and at the Sound Ways Festival of New Music in St Petersburg on 16 November. See the Helios Chamber Opera website for further details.